Living in, or visiting the rural Omemee area? Looking for something to do? You would be surprised at all the activities going on within 15 minutes of Omemee. Scroll Down for a growing list of the different clubs and activities in the Omemee area. Have your event highlighted! 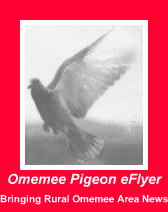 Contact Omemee Pigeon eFlyer! What's Happening at Omemee Area Venues?